ICYMI, we are heading to New Zealand in October with Active Adventures for a week of hiking, biking + kayaking around beautiful South Island! We're bringing you this adventure because we think there's a need for trips that are action-packed; that have you out + about as much as possible, exploring grand landscapes up close and personal. If you love to travel this way, this trip is for you. WHERE: Starting + ending in Queenstown, the Adventure Capital of the World! Day 1: arrive + meet the group in Queenstown! Now, we’re not meeting until 6pm and flights can land way before this sooo this gives you some time to wander around this extraordinary town. And I don’t use the term “extraordinary” lightly. I have met Canadians and Americans who hail from alpine towns remark how unique QT is because not only do you have these beautiful mountains but you have these sparkling turquoise vast lakes. I could gush forever about the landscapes here. And after all that, your adventure is ONLY JUST BEGINNING. Day 2: we're going on a sneaky overnighter in Mount Aspiring National Park! We're putting on our bigger packs and hiking 3 hours to the Hut. This is a 8.8 kilometre hike with a 120 metre elevation gain so pretty gradual which means we’ll have plenty of energy to soak up the views. At the Hut, we’ll have the rest of the day to chill, playing cards, reading, chat and just pinch ourselves that we’re in such an incredibly place and we got there on our own two feet! For those who have never stayed in a backcountry hut before, you’re going to love Mount Aspiring Hut. Day 3: we'll stop by Rob Roy Glacier on our way out of Mount Aspiring Hut to take in the amazing and ancient world of glaciers, mountains, river valleys and alpine lakes. Honestly, it is immense here. I found it hard to tear myself away. Then we'll be biking the Hawea River Trail which is a flat, maintained trail so don’t worry, those who haven’t done much cycling, this will be a relatively easy ride! The ride ends in Wanaka, a charming lakeside town. From Wanaka, we’ll be driving along the Crown Range Pass, New Zealand’s highest road, to return to Queenstown. This is one of the most spectacular drives - even the driving in New Zealand is a spectacle!!! Day 5: Next up is Fiordland National Park, New Zealand’s largest national park. 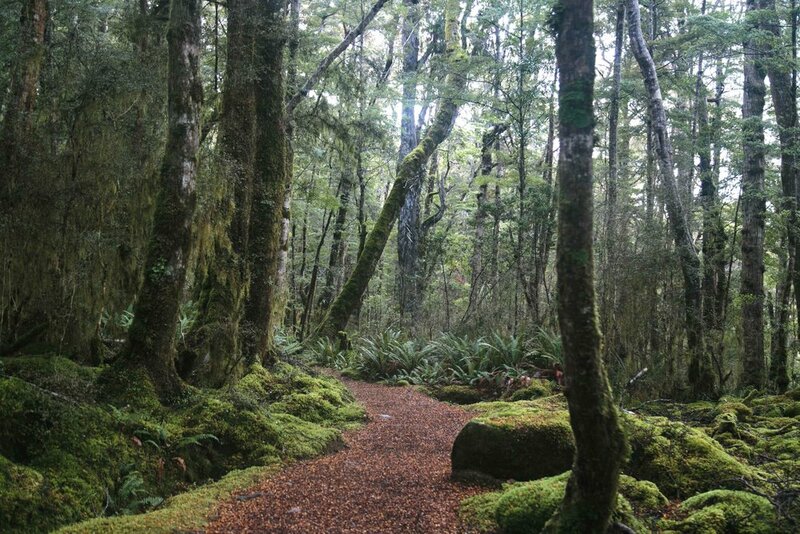 We’ll hike 2-3 hours along the Kepler Track, one of New Zealand's Great Walks, through lush beech forest and fernery. You will feel like you’ve stepped right into Avatar. This is a 10 kilometre hike with practically no elevation gains or losses so it’s going to be a very much welcome active recovery day after Ben Lomond. It’s a really rejuvenating walk. Day 6: nobody is going to want this adventure to end but end, it must! And at least we're ending it all with a MASSIVE bang. AND IT’S NOT QUITE OVER YET. We’ll be spending our last night together in Te Anau. Day 7: it’s time to fly home 😞We’ll be back in Queenstown for those with flights to catch (after midday only!!). For those who can’t quite say goodbye yet, there are so many other adventures in + around town. Just a few examples: hike up Queenstown Hill, walk along the Sunshine Bay track, take a day trip to Glenorchy or Arrowtown, camp overnight at Moke Lake. It is a neverending smorgasbord of adventures here! OR enter your details below for the official info pack!